I don’t know if I have ever mentioned this on the blog, but I love coconut. It is definitely up there in one of my top 5 – 10 flavours, somewhere behind chocolate and peanut butter, but ahead of rhubarb and raspberries 😉 It’s awesome in muffins, soups, smoothies, and more! It can be sweet or savoury, pairs well with so many other flavours, and makes everything seem just a little more tropical – great for when you can’t exactly take that exotic vacation. Not to mention, coconut is a hot health food these days (a quick search of the internet will tell you all its miraculous wonders!) Needless to say, I was pretty excited when I received the opportunity to review a cookbook devoted to coconut. 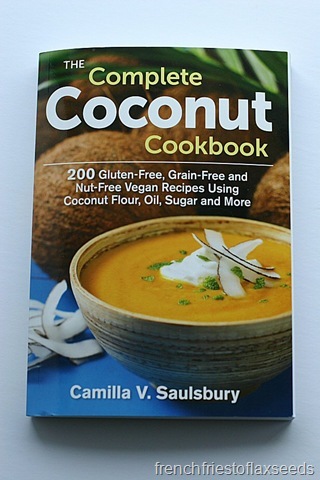 The Complete Coconut Cookbook by Camilla V. Saulsbury contains “200 Gluten-Free, Grain-Free and Nut-Free Vegan Recipes Using Coconut Flour, Oil, Sugar, and More” and is published by Robert Rose. You’ve probably seen countless titles by them here in Canada (Dietitians of Canada published their cookbooks with them as well). I really enjoy the layout of the recipes, as they are easy to follow, and offer great tips in the margins for each recipe. This cookbook starts with a history on coconut, how it has come and gone out of favour in western society over the years because of it’s high saturated fat content, and some information on current research into it’s health benefits. Whether I am completely convinced of all its reported health benefits remains to be seen, but I do appreciate that coconut is a whole, real food, and can be included in a healthy diet. There is also discussion on the different coconut products available (flour, dried coconut, water, butter, etc), and their uses. The book includes some great tips, like how to open a young coconut (not my method, but I’m sure it works as well), and information on the sustainability of coconuts. There are plenty of delicious recipes, ranging from baked goods to main dishes, soups to salads, and everything in between. As stated before, the recipes are all gluten-free, grain-free, nut-free, and vegan, so they are suitable for people with a variety of dietary restrictions. It also includes select colour picture of some recipes. 1. I’m not entirely sure why the book is gluten/grain/nut free and vegan. I wish this was explained, either on the back cover, or in the text at the beginning of the book. It’s not that I have an issue with catering to special diets (and it’s great to have resources like this for counselling patients if needed), but other than being “trendy” I can’t tell why the author has chosen to do this. The only thing I can infer from reading some of the book is that the author may be promoting a higher protein, lower carb diet, which is why there are no grains. But this still doesn’t explain the no nuts part. And it’s not paleo, because legumes are included, so some explanation would have been nice. 2. The book talks about stocking your pantry with other “staples” after going through all of the coconut products. While not a bad tip (especially if you want to make the recipes), it doesn’t flow well with the intro to the book, and seems kind of random. Back that could just be me. 3. All of the baked good recipes use a combination of coconut flour, chickpea flour, potato starch, and psyllium husks. It’s not that I have anything against these ingredients, but it put me off from making them, since I would have had to go out and buy 2 or 3 new products which I might only need a few tablespoons of for a recipe. If someone was on a tight budget, and wasn’t sure they would like the results, this could be a turn off. Since the baked goods were out, I decided to make a simple savoury dish to test out the cookbook. 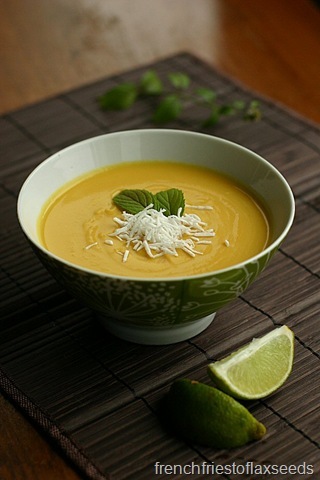 With fall being just around the corner, I went with a comforting carrot ginger coconut soup. It seemed like the perfect transition dish from summer to fall, and was a simple enough recipe to whip up for dinner on a weeknight. I also liked that I had most of the ingredients on hand – always a plus! 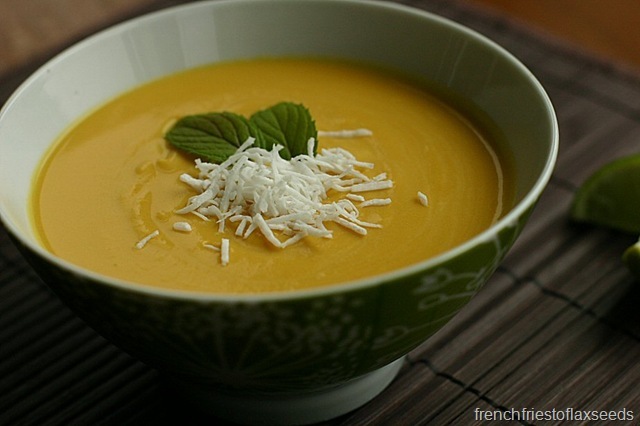 The soup combines carrots, onions, and ginger with 4 coconut products – oil, milk, water, and sugar – to make a beautiful velvety soup. 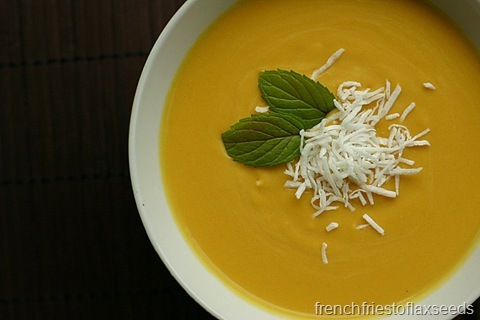 It is subtly sweet, and the ginger flavour just hangs out in the background, enhancing the warming properties of a good bowl of soup without overpowering the carrot and coconut flavours. 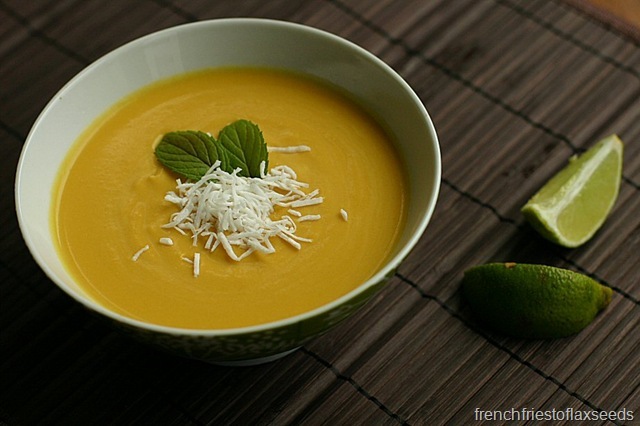 This was a first for me to use coconut water in place of broth – I think it enhanced the sweetness of the soup, although I don’t know if its totally necessary to make a tasty dish. It is definitely a soup I can see myself making again this winter, and makes me want to experiment with more of the recipes in the book. 1. In a large saucepan, melt coconut oil over low heat. Add onions and increase heat to medium-high; cook, stirring, for 5-6 minutes or until softened. 2. Stir in carrots, ginger, salt and coconut water; bring to a boil. Reduce heat and simmer, stirring occasionally, for 25-30 minutes or until carrots are very soft. 3. Working in batches, transfer soup to food processor (or use immersion blender in pan) and purée until smooth. 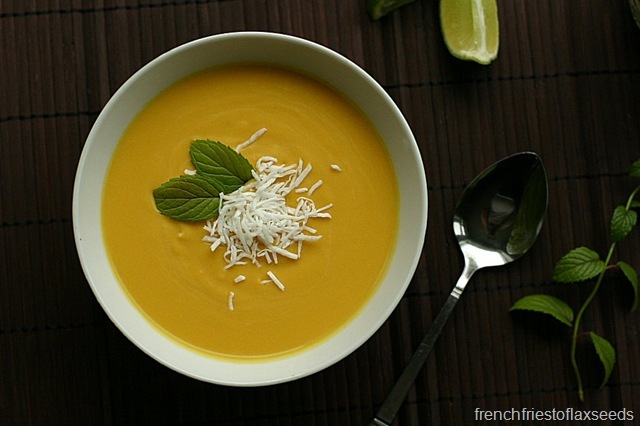 Return soup to pan (if necessary) and whisk in coconut milk, sugar, and lime juice. Warm over medium heat, stirring, for 1 minute. 4. Ladle soup into bowls and sprinkle with mint. Serve with suggested accompaniments, as desired. Coconut – do you love it? What’s your favourite way to use it?